Have We Discussed Creepy Santa? | Ooh Something Shiny! 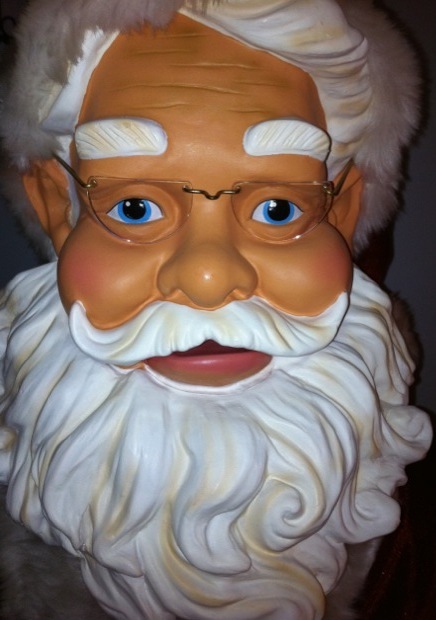 »Humor»Have We Discussed Creepy Santa? Have We Discussed Creepy Santa? 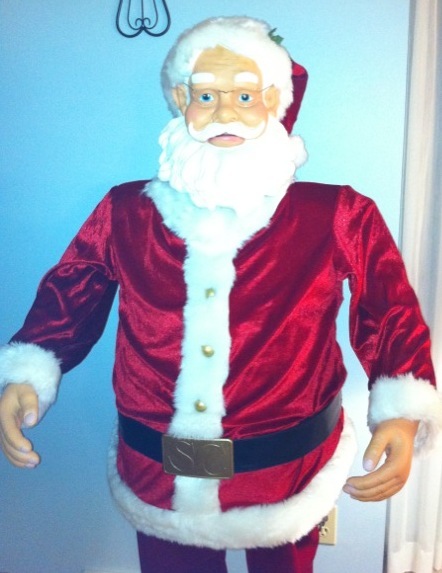 My husband bought this Creepy Santa a few years ago. He doesn’t think he’s creepy, but I’ll leave that up to you. He is full sized (in my world anyway– close to five feet) and motion-activated. I try to sneak past him by doing things like vaulting over the banister or Marine crawling across the living room, but I’m never sure if he is turned on or not. When he senses motion, he gyrates awkwardly, flailing his arms. I think it’s supposed to be dancing, but he looks like he should be driving a windowless van and holding a bag of candy. He sings and says a variety of things like “Ho, ho, ho” or “Merry Christmas” or “I’m going to cut you in your sleep.” Well, maybe not that one. In the off-season, Creepy Santa lives in our basement. We have always had a distinctly, non-creepy basement. It’s rather nicely finished, in fact, so creepiness had to be imported, in the form of Creepy Santa. I was actually starting to wonder if my husband got Creepy Santa to keep me out of the basement with the bar and big screen TV, especially now that Creepy Santa has been joined by Giant Hairy 4 Foot Spider that he bought on sale at Walgreens. This year Creepy Santa made his first appearance standing in our kitchen where I was bound to stumble into him as I opened the door from the garage. ← No. No, That’s NOT The Best Of The Seventies. At All. Oh, yeah, definitely creepy. Like the Burger King creepy. Creepy Santa is not creepy. He’s like a ninja. You’re just not vulnerable to his charms. This made me laugh out loud and snort coffee up my nose. Thank you, but I don’t think that coffee is one of the Columbian exports intended to be snorted.